Click here for a blank 2018 proxy form. As you may know, car rummaging, thefts, and even car-jacking continue to happen – not only in Oakridge, but also in the neighboring communities. Oakridge Management continues to work with the City of Hollywood Police Department to help educate residents. A Hollywood Police Watch Order is still in effect – meaning that the Police Department is providing extra patrols and license plate readers have been placed along SW 35 Avenue. 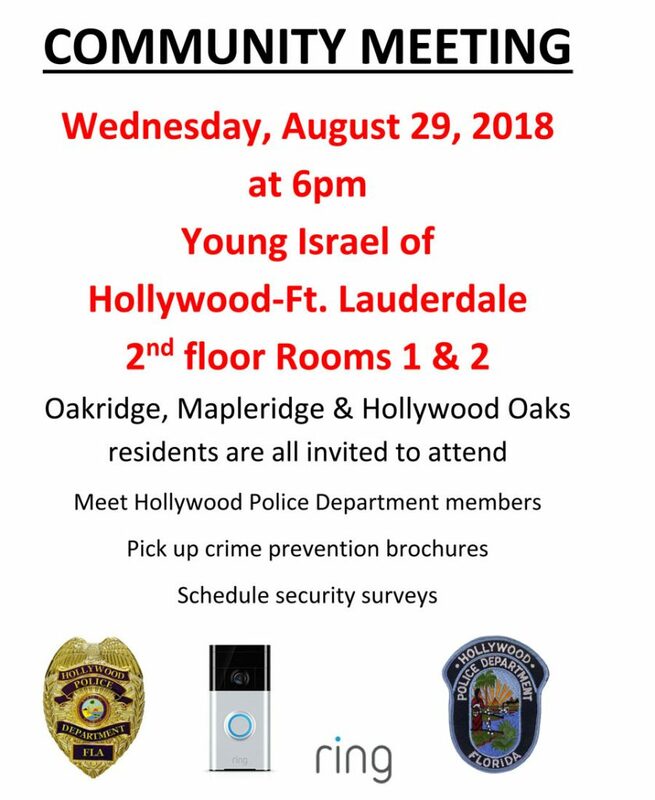 The City of Hollywood Police Department will also hold a Community Meeting for the residents of Oakridge, Hollywood Oaks and Mapleridge. on Wednesday, August 29, 2018 at 6p.m. (Hollywood Police Department Community Meeting Notice and important safety tips can also be found on our website: www.oakridgefl.com). Remember: criminals are constantly thinking of new ways to target victims and you must outsmart a thief. Personal security and safety over your property is your responsibility. Everyone must be vigilant. Below you will find that Local Law Enforcement has provided effective safety tips to help protect yourself against car rummages, and even car theft. We need your help to keep our community safe. If you see any suspicious behavior in your neighborhood, please call 911 immediately. Residents, be aware of your surroundings out in public during any type of interaction with someone you don’t know. Recently, there was a vehicle stolen from a female who was alone in her car at Stirling Road and SW 35th Avenue. This incident occurred when a criminal purposely bumped into her car from behind while stopped at the traffic light. When the victim got out of her car to check for damage, the rear vehicle passenger jumped into her car and both vehicles fled the scene. To ensure this incident doesn’t become a regular occurrence please read the below suggestions. Drivers must pay attention to their surroundings. Robbers sometimes target people leaving banks, casinos or shopping malls. A stranded motorist is a prime target for a criminal. Stay IN your car as you call for help on your cell phone. Law enforcement recommends that if you do get bumped on the road, to signal the other driver to follow you to a public place and write down the license plate if possible on the way there. Late night or early morning drivers should not to get out of their vehicles if bumped from behind. If someone bumps your car, it’s probably best to stay in your car and call the police instead of attempting to handle it yourself. Predators know that they can get your keys, car, and/or cash whenever you’re in or near your car. While going to or from your car, make it a habit to hold pepper spray at the ready, have a personal security alarm (noisemaker or screamer) or keep your thumb on your car key’s Emergency Button to blow the car’s horn. Criminals will use distraction techniques to relieve you of your valuables. If you are bumped by another car, make sure there are other cars around, and then check out the car that’s rear-ended you and who’s in it. Stay in your car, crack the window slightly and insist on moving to a police station or busy, well-lighted area to exchange information. Professional thieves can steal any car, but make them work for yours. To prevent theft, the National Insurance Crime Bureau (NICB) recommends “Layered Protection.” The more layers of protection on your vehicle, the more difficult it is to steal. The third layer of protection is a device that prevents thieves from bypassing your ignition and hot-wiring the vehicle. The final layer of protection is a tracking device that emits a signal to a police or monitoring station when the vehicle is reported stolen. Tracking devices are very effective in helping authorities recover stolen vehicles. Passive and active anti-theft devices are the two options available when considering an anti-theft system. Passive devices automatically arm themselves when the vehicle is turned off, the ignition key removed, or a door is shut. No additional action is required. Active devices require some independent physical action before they are set, such as pushing a button, or placing a “lock” over a vehicle component part. This physical action must be repeated every time the anti-theft device is set or it will not function. Notice: Florida has a broad public records law. All correspondence sent to the City of Hollywood via e-mail may be subject to disclosure as a matter of public record.